I haven’t posted about Steven Universe since late last year, when I was all agog about the pilot. I have been watching, though, and I’ve been liking how the show has slowly built a universe that’s equal parts kaiju fights and beachside campfires. 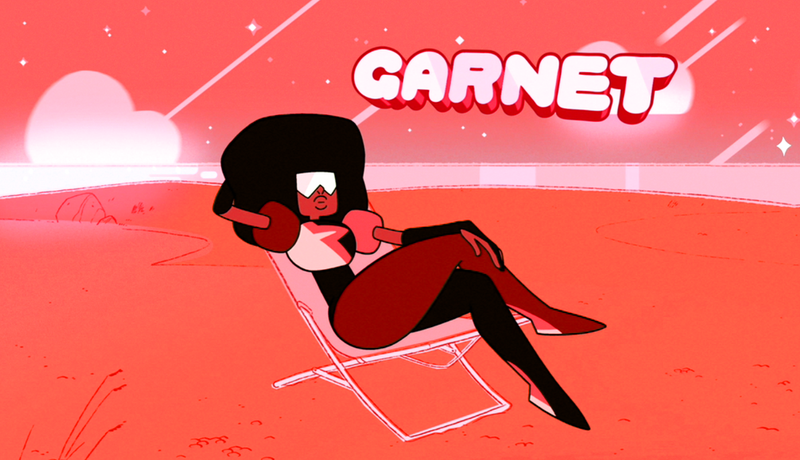 The show has also offered the world three awesome superheroines: the willowy, Diane Chambers-like Pearl, the brash, Cree Summer-sounding Amethyst and my personal favorite, Garnet, a towering, laconic woman whose stylish glasses hide a third eye, because she’s that rad. She comes off like a cross between Storm and Cyclops — always collected, always with a plan… the glasses, I guess — and I can’t think of another kids’ show that features a character quite like her. Garnet isn’t big on emoting, especially in comparison to her teammates. This suits her character just fine, but I initially wondered if this arose from the fact that the woman who voices her hasn’t acted all that much. She’s Estelle, who came to fame alongside those other mononymic British singers Adele and Duffy. I didn’t think I was familiar with Estelle’s non-superhero work until I realized she sang “American Boy,” this flirty, upbeat track that seems at odds with Garnet’s stoic personality. I wouldn’t have guessed that the same person could sing that song and play Garnet, but hey — maybe Estelle has acting range after all. Here’s the weird thing: The version of “American Boy” I have came to me via a mix CD exchange back in 2008, and it seems different from all the versions I’m seeing on iITunes, on YouTube and elsewhere online. The version that became popular features Kanye West rapping alongside Estelle. My version doesn’t. I prefer it. (If there’s an option for a Kanye-less version of anything, I prefer it, generally.) I don’t know if my version is an original mix or retread focusing just on Estelle’s vocals. But because I just couldn’t find it all that easily online, here’s Estelle’s “American Boy,” minus Kanye. One quick Steven Universe-related postscript: On the show, Steven is a pudgy, irrepressibly imaginative boy who maybe-sorta has a love interest in Connie Maheswaran, a bookish girl-next-door type with overprotective parents. I’d like to think her name is an homage to Connie Souphanousinphone from King of the Hill, the bookish girl-next-door type who also had overprotective parents and who dated Bobby, another pudgy, irrepressibly imaginative boy. Anyone else see this? I will maybe inquire further to find out if it’s actually a thing. Are the Connies the same nationality? No. 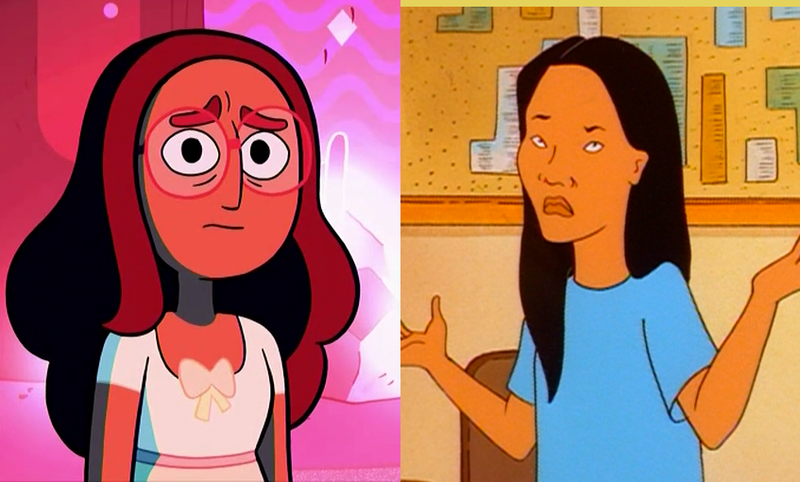 Connie Maheswaran is Indian-America but Connie Souphanousinphone's family is from Laos. I LITERALLY MADE THE CONNECTION BETWEEN CONNIE AND BOBBY AND CONNIE AND STEVEN! I am so glad I am not the only one who noticed it. Oh wow. Yeah, it's better without Kanye...that seems to be a thing though: covers of female R&B singers, with the original artist joined by a "featured" male rapper. I can't complain, there are so many good songs that would have never gotten the air-play for me to be aware of them, if this didn't happen (and West's public image kinda fits for the guy Estelle is singing about....)-Estelle isn't widely known in the States, yet. The image of Square Mom on the screen while she was singing was kinda off-putting though...she sometimes sounds a lot like a voice she sometimes uses while she is playing Garnet, and I can not picture the ironically named "Master of Comedy" feeling this way about some Brooklyn hood-rat, with a slick tongue, and slick sneakers...Garnet is WAY to self contained. That's the thing about Garnet, she seemed reticent and laconic (what a great word, "speaking like a Spartan," I love it) to me at first, too-but rewatching the episodes, it now seems to me like the animators, and Estelle gave her a great deal of subtle depth, it is probably a function of what she is and can do-if I were semi-permanently joined with my love-of-a-civilization's-lifetime, and could visualize the myriad possibilities any action could create, I'd probably be pretty content to sit quietly with myself a lot, too...we've certainly seen small moments of intense overt emotion from Garnet, now, and the contrast really works. I have to think that Garnet's portrayal was intentional on the part of the show-runners, a feat of characterization that is really paying off, in the long-game.